Genuine OEM Epson Ink Cartridge, Light Light Black, 450 page yield. Epson part number: T059920, T0599. Compatible Epson Ink Cartridge, Light Light Black, 450 page yield. 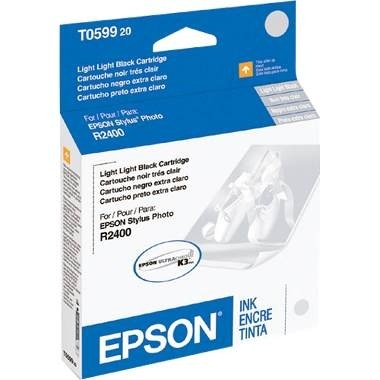 Replaces Epson part number: T059920, T0599. Remanufactured Epson Ink Cartridge, Cyan, 450 page yield. Replaces Epson part number: T059220, T0592. Remanufactured Epson Ink Cartridge, Magenta, 450 page yield. Replaces Epson part number: T059320, T0593. Remanufactured Epson Ink Cartridge, Yellow, 450 page yield. Replaces Epson part number: T059420, T0594. Remanufactured Epson Ink Cartridge, Black, 450 page yield. Replaces Epson part number: T059120, T0591. Remanufactured Epson Ink Cartridge, Light Cyan, 450 page yield. Replaces Epson part number: T059520, T0595. Remanufactured Epson Ink Cartridge, Light Magenta, 450 page yield. Replaces Epson part number: T059620, T0596. Compatible Epson Ink Cartridge, Matte Black, 450 page yield. Replaces Epson part number: T059820, T0598. Compatible Epson Ink Cartridge, Light Black, 450 page yield. Replaces Epson part number: T059720, T0597.